I have no idea why, but litigation in The Hobby is always crazy. And to no one’s surprise, the Upper Deck v. Leaf case in California and its counterpart Leaf v. Upper Deck in Texas are no different. Not only has there been a greater-than-normal number of filings between the Upper Deck California case and the Leaf Texas case, but there are also pending motions to transfer in both cases…meaning either one of them could be consolidated with the other…thereby potentially obviating all the work done in the transferred case. Legal aside: Yes, it’d be fun if the California case was sent to Texas at the same time the Texas case was sent to California. And while things like this do seem to happen quite often in The Hobby’s litigation, it is unlikely here as each judge does have a phone in his office and would give the other a heads-up just in case. Still…it would be glorious to see. And while we don’t have final rulings in either case (yet), there are a few updates in each worth discussing. Leaf v. Upper Deck: Where the action is! It’s crazy to think but Leaf’s antitrust case—a normally complex case-type that lasts a long, long time—is the fastest moving and furthest along, and because of that is likely the case that will drive both actions towards settlement. Although filed on November 22, 2017, there are already 49 docket entries, including temporary restraining order briefing, motion to transfer briefing, and competing motions to compel filed against each other. Legal aside: While most law firms’ billable hours reset in January, I think we know a few lawyers that are well on their way to reaching their 2,200 billable hours requirement. Now, a temporary restraining order is an exceptional remedy, so denial of this motion was the most likely outcome. There are two main reasons such motions get denied: 1) no likelihood of success on the merits or 2) lack of irreparable harm. The court’s order relied solely on a lack of irreparable harm and did not address whether Leaf was likely to succeed on the merits. Because of this, neither side has a hint as to which way the judge will ultimately rule (if the judge even knows). The court’s order, however, gave both sides more time to prepare their cases. As the schedule currently sits, Leaf will file its application for preliminary injunction on March 12, 2018, Upper Deck will file its response on March 30, and Leaf will file its reply on April 6. After that, the judge can rule, or schedule a hearing. Like a temporary restraining order, Leaf’s motion for a preliminary injunction also seeks an exceptional remedy, so odds are it’ll be denied too (most likely for lack of irreparable harm). BUT, Upper Deck’s filings also show some chipping away at the likelihood of success on the merits as well. 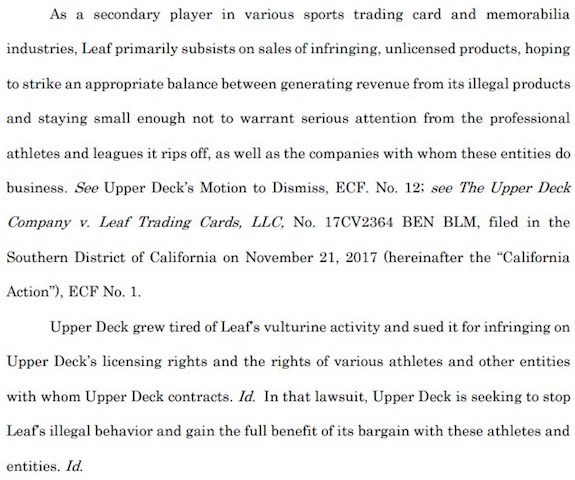 The premise of Leaf’s antitrust suit focused on Upper Deck’s alleged exclusive licenses with its distributors which allegedly prevented those distributors from carrying Leaf products. Upper Deck, however, appears to have produced 1) evidence that the agreements were not exclusive and 2) declarations of some of the distributors stating they chose to not carry Leaf products for reasons other than their distribution agreement with Upper Deck. Although some of these filings (and responses thereto) are under seal, if these issues are proven, they challenge Leaf’s position. On the gaper-ing side, one of Upper Deck’s briefs strikes a strident tone, and unloads on Leaf. Legal aside: Yikes! No, Upper Deck, really…don’t hold back. Tell us how you really feel! Briefs in courts are normally more cordial than this…BUT…we’ll just say Upper Deck’s attorneys got caught up in the frenetic pace of filings and needed to vent a little. Legal aside: Though I think the court should allow Leaf an equally testy response. Substantively, the most interesting issue arises from the competing motions to compel that Leaf and Upper Deck have filed against each other. The most notable issue is that Leaf initially intended to rely upon Brian Gray, its CEO, as its expert for the preliminary injunction motion. Upper Deck now alleges that Leaf is attempting to withdraw Gray as its expert. In its motion to compel, Upper Deck amusingly asks the court to force Leaf to use Gray as its expert. 1)Upper Deck alleges it spent a lot of time and money rebutting Gray’s opinions. So, given the expedited schedule, it would be unfair for Leaf to change experts at the last minute. Legal aside: While this is an enticing argument, I can’t tell from the briefing (again, some of which is under seal) if this is truly a “last minute” change. If it is, Leaf will likely have to rely upon Gray as its expert. If it’s not, Leaf will likely be able to run its case the way it wants to. 2) Opposing parties are allowed a great deal of discovery on experts, so Upper Deck is entitled to all documents that Leaf’s expert relied upon in forming his or her opinions. Because Gray is the CEO of Leaf, this could require production of a lot of Leaf materials and information, including some Leaf would normally want to keep from Upper Deck. It also potentially raises attorney-client privilege concerns, because if Gray relied upon communications from his attorneys in forming his opinions, those would be fair game for discovery. Legal aside: To play Monday morning quarterback, it would have been better for Leaf to rely upon Brian Gray as a fact witness only and not an expert witness. That way there’d be less concern about what information needs to be produced. Also, a non-Leaf expert witness just looks better and less biased. 3) If Upper Deck forces Leaf to use Gray, it obviously prevents Leaf from using another expert. And it’s probably understood, but if Upper Deck dictates who Leaf uses as an expert, that interferes with Leaf’s strategy, and certainly gives Upper Deck a leg up. What to watch for in the future: the most important upcoming dates are March 12, March 30, and April 6. This is when we’ll see the parties’ preliminary injunction briefing. At that point we’ll better be able to assess the strengths of each case…unless they file these documents under seal…at which point we’ll just have to hope that Leaf responds to Upper Deck’s “vulturine activity” comment in a publicly available document. Upper Deck v. Leaf: A First Amendment Showdown. Although the Upper Deck California case is slower moving, that does not mean nothing has happened. In fact, this case might have the biggest ramifications on The Hobby. What I think is the most important issue between the two cases is raised in Leaf’s anti-SLAPP claim against Upper Deck. Legal translation of legal translation: A SLAPP lawsuit is one that normally has no merits and was brought only to silence the other side. An anti-SLAPP lawsuit then is the defense/claim that the party who is trying to be silenced can raise. Anti-SLAPP lawsuits typically focus on First Amendment grounds, and, in some cases, jump in front of the plaintiff’s claim and are decided first. In its anti-SLAPP claim, Leaf alleges that Upper Deck brought its lawsuit to stifle Leaf’s First Amendment speech. While seemingly a silly issue, this claim does have importance outside of this case. The Hobby (for better or worse…much, much worse) is dictated by exclusive licenses. If the court finds that Leaf’s trading cards are subject to First Amendment protections, that is a beginning of the chipping away at those licenses. I’ve long felt that the Leagues (MLB, NFL, NBA, NHL, etc.) and trading card companies wield their intellectual property over trading cards with too heavy a hand. The fact that The Hobby believes you need a license to show a player in uniform is annoying and I think legally incorrect. If a company rightfully purchases a picture of a player in uniform during a game and wants to use that picture in a trading card, that should be protected by the First Amendment. The reason: it depicts factual history. It’s not the most important history mind you, but a player who goes 0-3 with a walk is just as much a part of the history of baseball as another player in that same game that hit three home runs (scoring that same player the one time he got on base). The Leagues’ use of trademark law and the trading card manufacturers' use of exclusive licenses to prevent such reports on history limits the distribution of facts and history. I believe that runs afoul the First Amendment and is an improper limitation on The Hobby. (And Paul’s rant ends just as the final notes of “The Star-Spangled Banner” drift into silence). 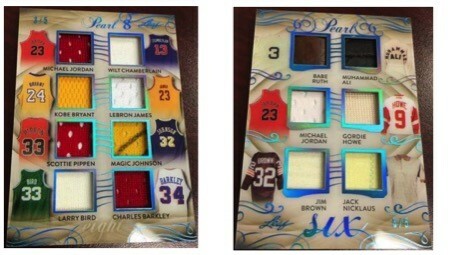 Sure, swatch cards (like Leaf’s at issue here) are also not the most important history, but they do show images of the jerseys from which the swatches were made and give the players’ names. Fact 1: here’s the jersey the swatch was made from. Fact 2: this jersey was jersey. Given this, I believe Leaf should ultimately win this case. But, will Leaf win the anti-SLAPP motion? That’s a more difficult issue, because this is an issue of first impression for a court. It’s not like Upper Deck has no basis for its claim…it is suing on behalf of its exclusive athletes. Because of this, I don’t think Leaf wins the anti-SLAPP motion…but it still should win the case. The court will hold a hearing on the anti-SLAPP claim on April 2, 2018, and we’ll get Upper Deck’s opposition before then, but beyond the antitrust big-guns that are going off in Texas right now, this under-the-radar issue might have the biggest effect on The Hobby. And is the one I’m watching the closest. Check out all of Paul's earlier Law of Cards articles. The information provided in Paul Lesko's "Law of Cards" column is not intended to be legal advice, but merely conveys general information related to legal issues commonly encountered in the sports industry. This information is not intended to create any legal relationship between Paul Lesko and the user. Neither the transmission nor receipt of these website materials will create an attorney-client relationship between the author and the readers. You should not act or rely on any information in the "Law of Cards" column without seeking the advice of an attorney. The determination of whether you need legal services and your choice of a lawyer are very important matters that should not be based on websites or advertisements. 2017 Leaf-Dignified Heir:GRETZKY MCDAVID, #3 3,BGS9.5! 2017-18 LEAF PEARL HOCKEY DUAL PATCH WAYNE GRETZKY BOBBY HULL 1 2 SP! 2017 Leaf ITG Stickwork Wayne Gretzky Greatest of All Time Dual Stick 16 25!